Mobile friendly blogger template: Blogger is very easy to use blogging platforms where a fresher can start his/her blog. Giving your blog a professional form can be a difficult task for many fresher bloggers. But everyone deserves a beautiful design for their blog. That’s why we have published a hand-picked list of Top 10 best mobile friendly blogger template in 2019. These templates can be used very well for various blogs like movie blogs, game blogs, magazines blogs, etc. This article will be updated regularly with the best SEO optimized blogger template so keep visiting for the best. Let’s discuss the best Top 10 best mobile friendly blogger template in 2019. If you are desperate to start blogging, then there will be many things like content, CMS (platform) and design on the checklist. Apart from this, there are many other things to take care of, but for a start, these three things are really important. These three things will be fulfilled only when you use a mobile friendly blogger template. So make sure you are using proper and clean SEO friendly templates for the blogger on your blogs. It loading speed is very fast. If you are looking for free mobile-friendly blogger templates for your news blog, then NewsMagazine Template is one of the best options for you. It comes with a fully responsive design that automatically helps adjust the screen size based on the device used. Therefore, no matter where your viewers are or what device they are using for your news blog, it is going to be displayed on pixel completion and scale according to the latest device. Its unique design makes this template very attractive and easy to tweak to suit your needs. Advertising for NewsMagazineTemplate is easy and optimized. It comes with easy AdSense integration and helps improve ad impressions and clicks with its more efficient ad placements. The template that is in our list for SEO optimized blogger templates is Cyber Blogger Template. You can use this template for any website or blog. Like the name, the Cyber Blogger template is recommended for the new blogger. If you are looking for a Blogger template, then this template is for you because this template is clean, light and customizable for SEO. The basic idea of this template comes from seeing the most popular business and technology websites. Google site favors the load speed when determining page rank. Therefore, it is necessary that you use a clean and light template. A mobile friendly blogger template loads fast enough to keep your visitors on your site. This template is a tailored and optimized ad for placements. Cyber blogger template social sharing features give it an edge over other templates. In this template, you can easily add your social media profile links and share buttons. Hiero is a terrific magazine theme for bold colors and descriptions for your Blogger site content. It comes with a 2 column responsive layout so you can ensure that it works smoothly on every browser/device. In this template, you easily customize social media, and AdSense, It supports all impressive Blogger features. This is a semi-magazine template with some excellent content-based widgets to display important and eye-catching content on the top of your blog. It was designed keeping in mind the latest trends and technologies. This is the best SEO template for blogger and mobile friendly blogger template. Takis Theme is SEO Optimized Blogger Template. This template is a gorgeous style blogger theme designed for content. This blogger theme is easy to set up and maintain. This theme, customized with WordPress and also it has been designed with the latest technologies on the web. It’s lightweight, fast and supports cross-browser compatibility. The theme is responsive and adjusts the screen size on any user device automatically. This is fast loading, fully responsive and mobile friendly blogger template. Takis theme was optimized about the publication of ads and was recommended to use AdSense or something else. This is a high CTR, SEO friendly and responsive blogger SEO templates. This template is suitable for all types of blogs such as news blogs, magazine blogs, photo gallery blogs, video gallery blogs, movie blogs, personal blogs, etc. Flash Edition Blogger Template is a beautiful, clean and responsive theme that supports all types of post formats, which gives your blog a simple and elegant look. Flash Edition Blogger Template Social Sharing feature allows you to add your social media profile links and share buttons easily. This template is also lightweight so that it can be loaded fast, so keep your audience on your site. When determining PageRank, SEO-site, Google site favors the load speed. If you are a blogger looking for a new and SEO optimized blogger templates for your website, look for ‘Flash Edition Blogger Template’ and see if this is the right template for your blog. This template will give you a wonderful look at your website, which is easy for visitors to your website, and will provide a great experience to your visitors. News pro Blogger Template is a personal and magazine blogging theme. It’s clean and an elegant blogger theme. This blogger SEO template has great adaptation to create blogs of viral or popular news on the Internet. This is also easily optimized and very mobile friendly. This blogger theme is suitable for a wide range of blogs, for example, personal blogs, viral news, travel, etc. It is displayed accurately and clearly for any device. Customizing without any coding knowledge is easy. Tech Shadow is a beautiful mobile friendly blogger template. This template is a free blogger template with the customized design from WordPress theme. Using a responsive template is adjusted screen size depending on the device. When it comes to tech blog templates that are quite fast, there is no better template than tech shadows. The template is a design of your blog or website and ‘Tech Shadow’ Premium Blogger Template is a very sensitive Blogger Template. This template works very simply and works very fast with the blogger’s comment system. Nano Press Blogger Template is one of the best news blog templates. If you already have a simple news blog, but you are looking for a lightweight, clean blogger template, then Nano Press Blogger is your best choice. If you want to start a semi-magazine blog and do not know where to start from, then we recommend downloading this template. This is a clean and light template. A lightweight template loads quickly, which keeps your visitors on your site. Nano Press is mobile friendly blogger template. This theme is entirely mobile-friendly, fits the display and resolution of any size and supports all the latest browsers. This is SEO optimized blogger templates and helps to get high search engine ranking for your blog. This is a simple, user-friendly and functional blogging temple. Resizable is a responsive blogger template suitable for news, newsletters, magazines or review sites. This template is suitable for different screen sizes for modern smartphones and tablets. Focusing on content and readability was important because they were website owners. This template was optimized to give your pages the best on-page SEO score. Resizable is another fast loading template and has a highly responsive design with excellent features. Resizing for news sites, blogs and magazines is the perfect template. In this, the social media sharing button has been super clocked. Resizable Responsive Blogger Template has three columns with two sidebars and four column footer area widget. Resizable blogger template is coded with cleanly responsive designs. Here you can see a perfect Magazine Blogger Template, which starts by showing a banner where you can post about your latest post. Below you can highlight your latest blog post and author. This classy modern theme puts your content in front of you and thanks for minimal design and white space. You can configure your homepage using multiple layout options and choose how you want to display your sidebar. The theme comes with two custom widgets to show your recent posts and your social media profiles. Pixel is most suitable for news, technology, fashion, travel, and recipes. It is one of the most preferred templates and is specially used for multi-niche blogs. 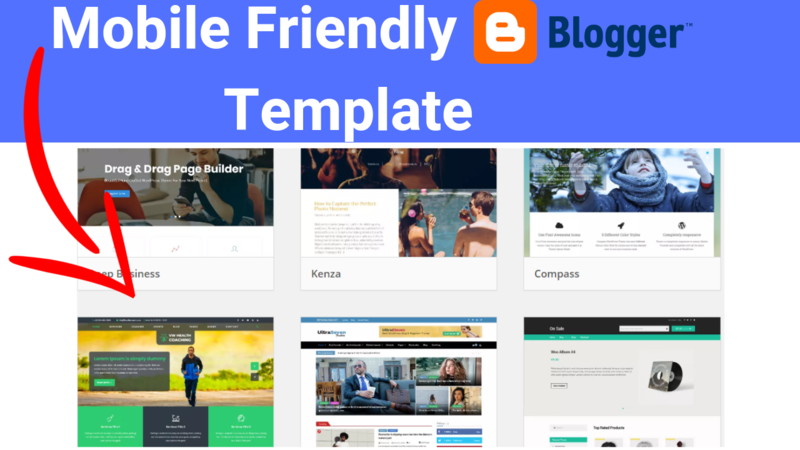 This is the Top 10 Best mobile friendly blogger template which you use of your Blog or website. There are so Many Paid and Free tools available on the internet. So, Pick one of the Theme and using it. if you think that article is helpful then share this on Facebook, Twitter and also subscribe to our youtube channel.